At first glance, I wasn’t sure if the word “midget” applied to the skis or the skier. 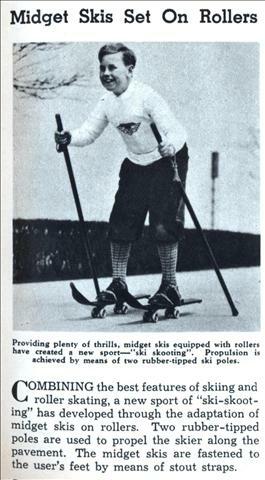 COMBINING the best features of skiing and roller skating, a new sport of “ski-skooting” has developed through the adaptation of midget skis on rollers. Two rubber-tipped poles are used to propel the skier along the pavement. The midget skis are fastened to the user’s feet by means of stout straps.